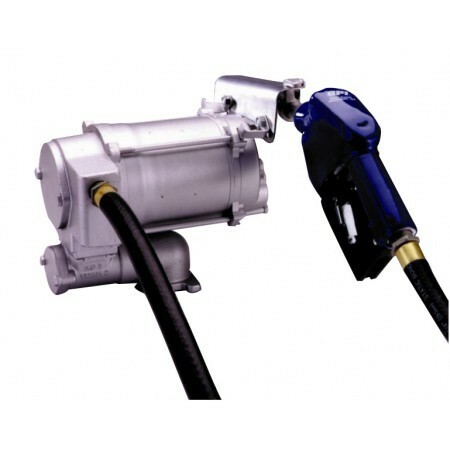 GPI EZ-8 12-volt DC Light Duty Aluminum Gear Pump is designed to transfer Gasoline, Diesel and Kerosene. EZ-8 fuel pump is designed for tanks up to 120 gallons. Pump delivers up to 8 gallons per minute and is ideal for on-the-go fueling. 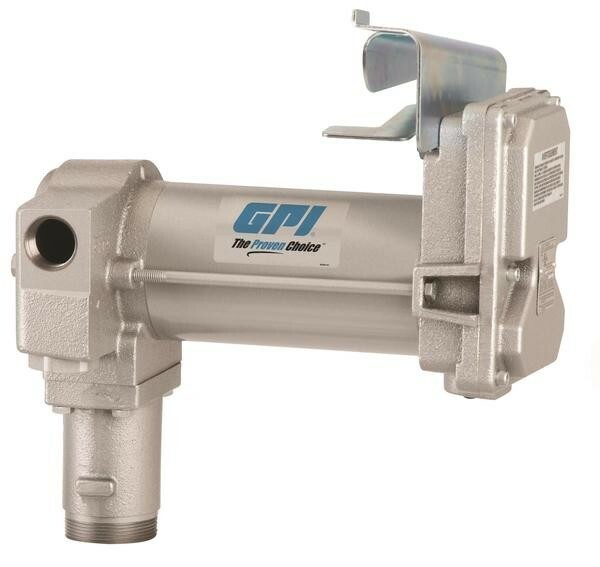 GPI M-150S-MU 110000-99 12-Volt DC Economy Version Aluminum Gear Pump for fuel with Manual Unleaded Nozzle. 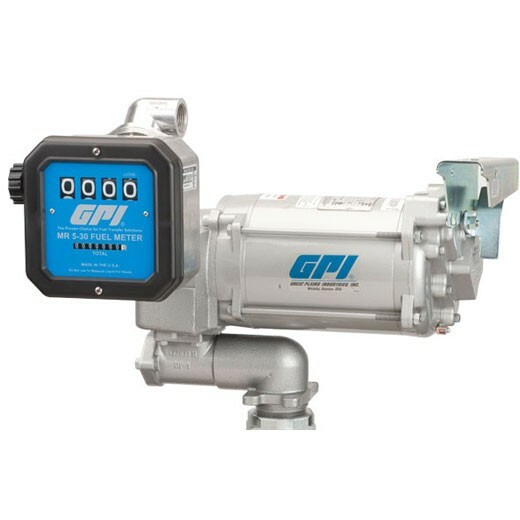 This GPI 12 volt pump delivers up to 15 GPM (57 LPM). Includes extra features including an extra hose, an adjustable suction pipe (22 to 40 inches) and a spin collar for easy installation. 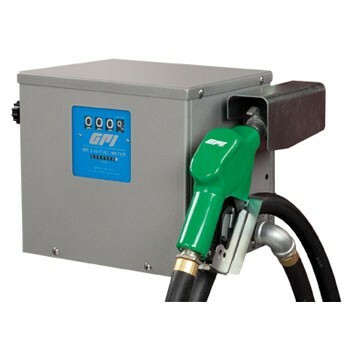 GPI M-180S-AU 110300-2 12-Volt Fuel Transfer Pump with Automatic Nozzle delivers up to 18 GPM (68 LPM). 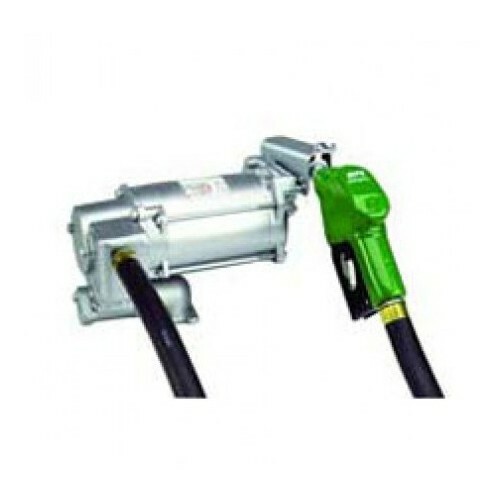 This GPI 12 volt diesel pump is a quick and ideal way to deliver gasoline, diesel and kerosene to farm and construction vehicles and equipment. 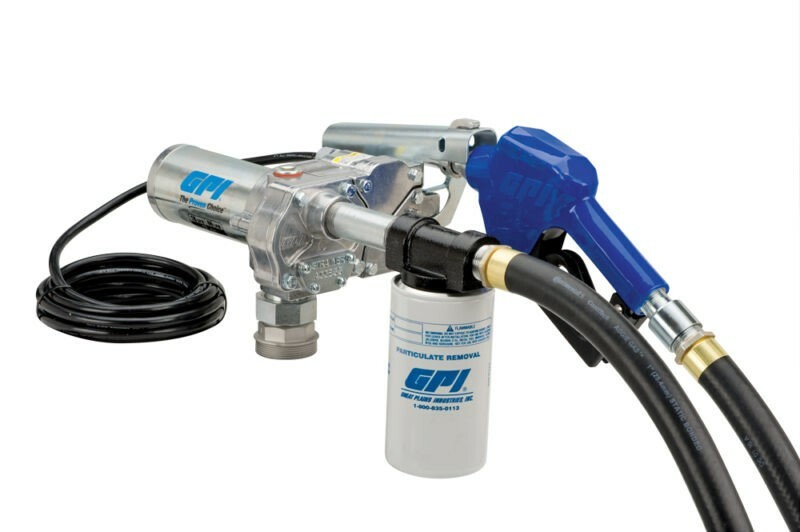 GPI 110300-1 M-180S-ML 12-Volt Fuel Transfer Pump with Manual Nozzle delivers up to 18 GPM (68 LPM). 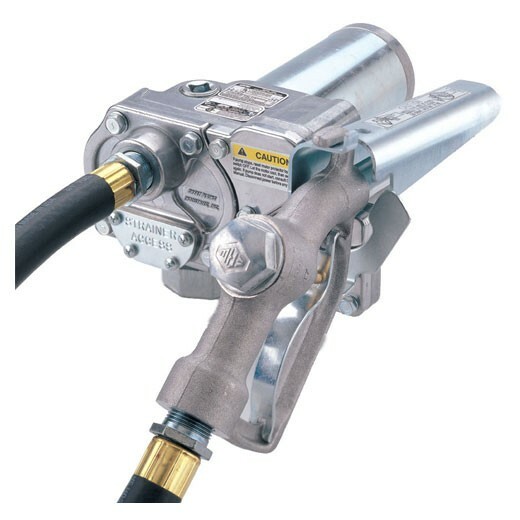 This Fuel Transfer Pump comes with a manual nozzle and is a cost effective way to transfer fuel quickly and easily. 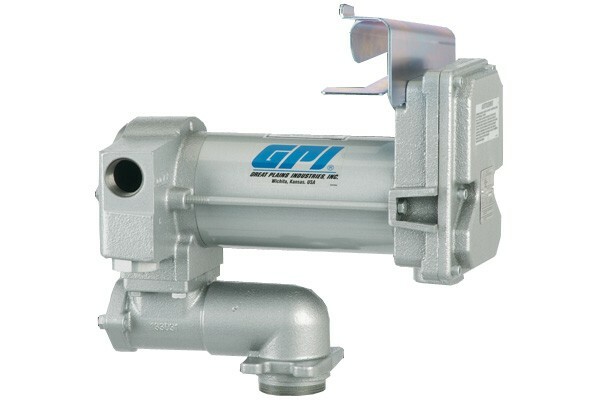 GPI 110000-70 M-240S-MU 24-volt DC Aluminum Gear Transfer Pump With Manual Unleaded Nozzle. 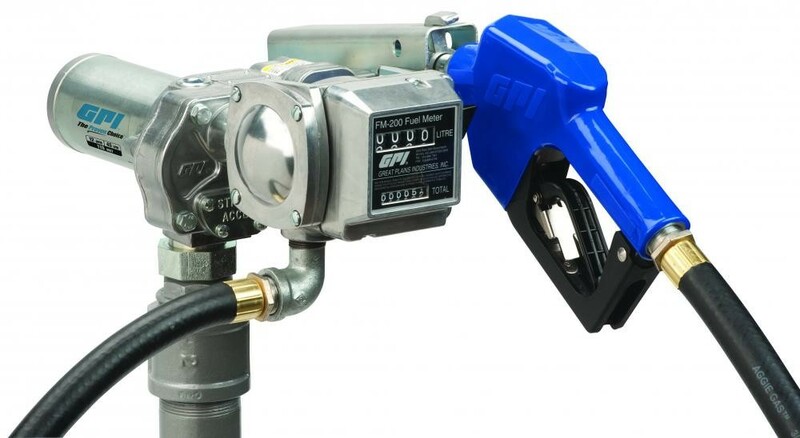 This GPI 24 volt fuel pump can delivers fuel up to 15 GPM (57 LPM). GPI 133240-07 M-3025-B100-ML 12-Volt DC Electric Vane Bio-Diesel Pump for B100 Fuel. Comes equipped with a Manual Nozzle. This heavy duty bio-diesel fuel transfer pump is used for quick fueling in farm and construction machinery applications. GPI 133240-1 M-3025-ML 12-Volt DC Electric Vane Fuel Transfer Pump with Manual Diesel Nozzle. Delivers diesel and kerosene up to 25 GPM (95 LPM). This heavy duty GPI 12 volt fuel transfer pump is essential for your high flow fueling needs in the farm and construction industries. GPI 133262-03 M-3025CS-PO 12-Volt DC Electric Vane Contractor Special Pump only. Delivers up to 25 GPM (95 LPM). 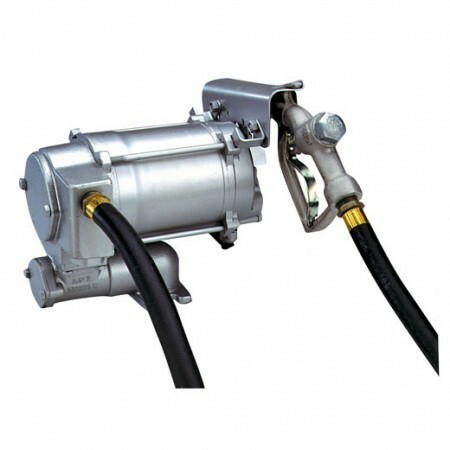 This 12 volt fuel transfer pump used mainly in the construction industry to fuel heavy equipment and generators. 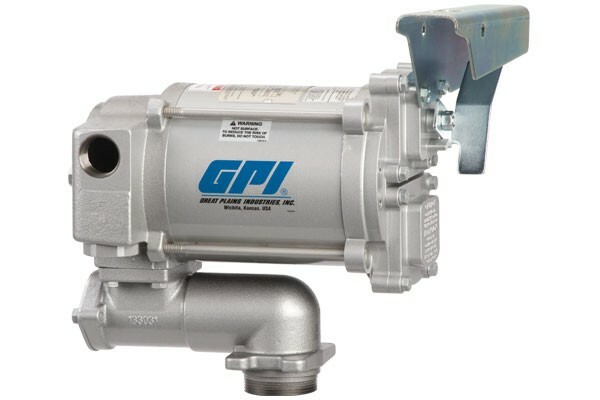 GPI 133260-02 M-3425-AL 24-Volt DC Electric Vane Pump with Automatic Leaded Nozzle. 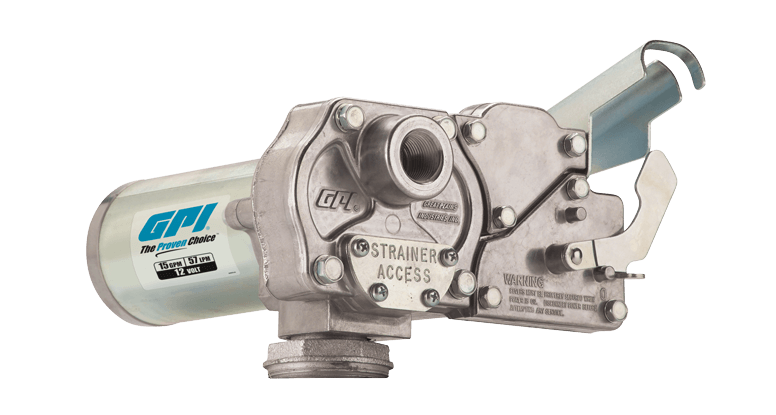 This GPI pump delivers leaded fuel up to 25 GPM (95 LPM). 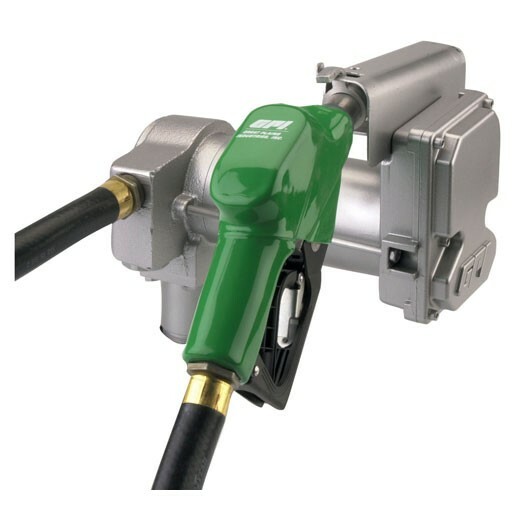 Use this high performance Fuel Transfer Pump on vehicle mounted tanks or vented storage tanks or when reduced fueling time is critical. GPI 133260-01 M-3425-ML 24-volt DC Electric Vane Fuel Transfer Pump with Manual Leaded Nozzle. 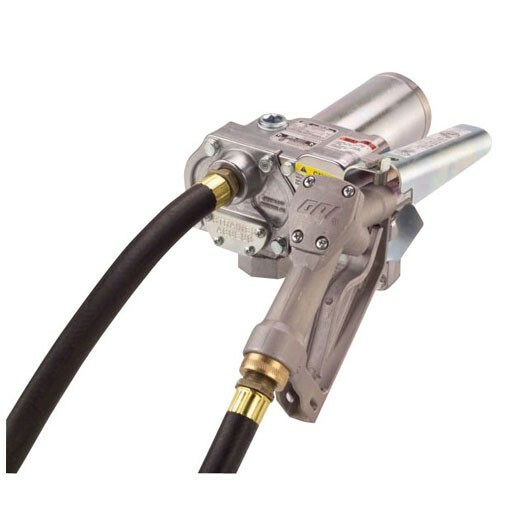 This fuel transfer pump delivers Leaded Diesel Fuel up to 25 GPM (95 LPM). 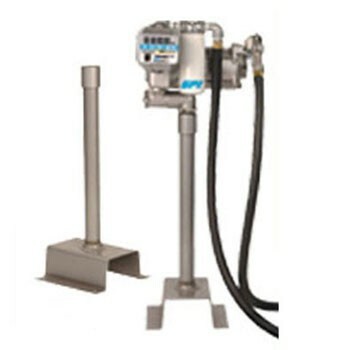 Used in high flow applications to reduce Fueling time. GPI L5016 142100-03 12-Volt DC Oil Transfer Pump for high viscosity fluids. Delivers up to 16 QPM (15 LPM). 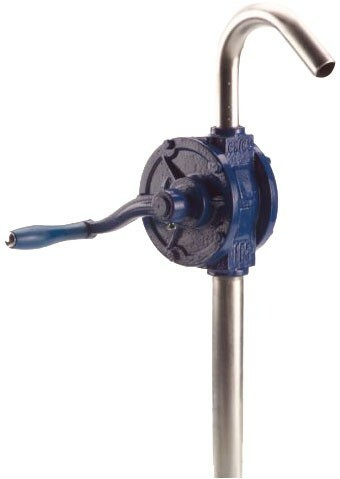 This lube pump includes 2-piece suction pipe, 8 foot hose, 90 degree street elbow and ball valve nozzle. GPI L5116 142100-01 115-Volt AC Oil Transfer Pump for high viscosity fluids. 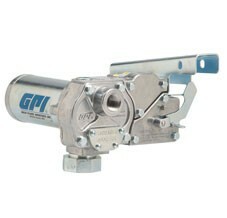 GPI lube pump delivers up to 16 QPM (15 LPM). Includes 2-piece suction pipe, 8 foot hose, 90 degree street elbow, 36 inch 3-prong cord and ball valve nozzle. GPI L5132 142100-02 115-Volt AC Oil Transfer Pump with 1 HP motor for high viscosity fluids. This GPI lube pump delivers up to 32 QPM (30 LPM). Includes 2-piece suction pipe, 8 foot hose, 90 degree street elbow, 36 inch 3-prong cord and ball valve nozzle. 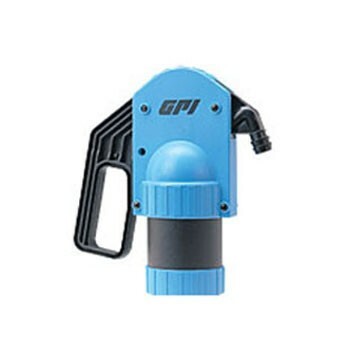 GPI P-200-BV 118000-9 12-Volt Electric Lube Pump for use with petroleum-based products. Delivers up to 8 GPM (30 LPM). Includes 12 foot Buna-N hose, 1 inch ball valve nozzle and adjustable suction pipe. 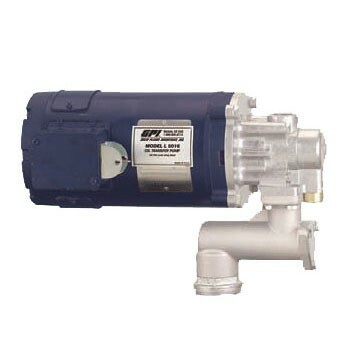 GPI PA-200-BV 118003-11 115-Volt Electric Lube Pump for use with petroleum-based products. Delivers up to 8 GPM (30 LPM). Includes 12 foot Buna-N hose, 1 inch ball valve nozzle and adjustable suction pipe. GPI M-1115S-AU 110000-82 115 Volt AC Light Duty Fuel Transfer Pump is designed for use with diesel fuel, gasoline and kerosene fuels. GPI M-1115S-MU 110000-81 115 Volt AC Light Duty Fuel Transfer Pump is designed for use with diesel fuel, gasoline and kerosene fuels. 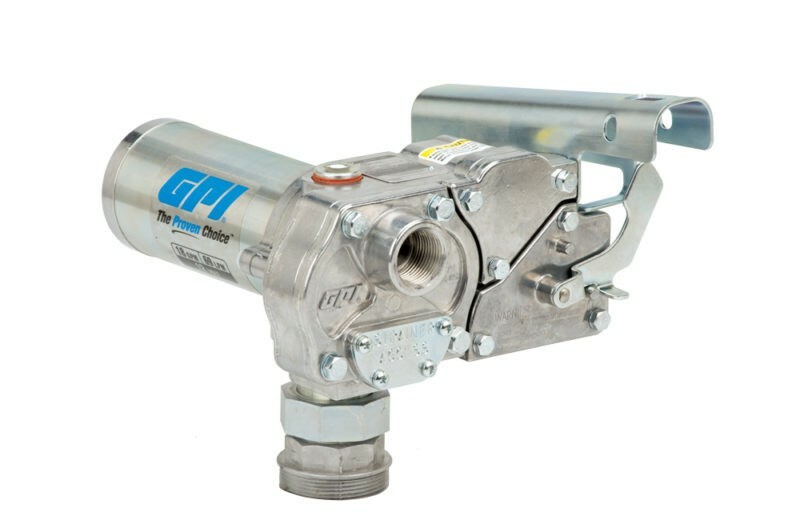 GPI M-3120-AL 133200-2 115 Volt AC Heavy Duty Vane Fuel Transfer Pump with automatic leaded nozzle delivers up to 20 GPM (76 LPM). 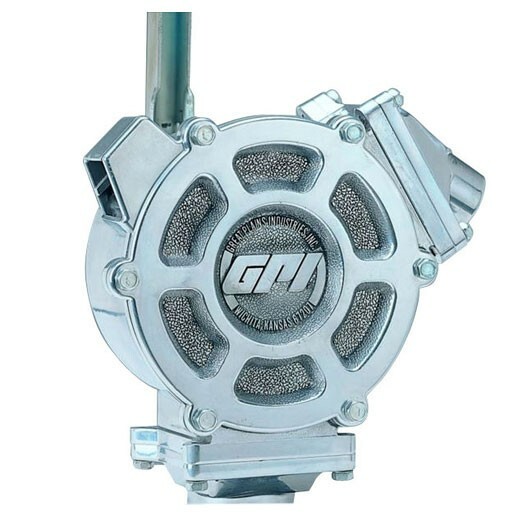 GPI M-3120-B100-AL 133200-06 115-Volt AC Heavy Duty Vane Pump for B100 fuel with automatic leaded nozzle. This 115 volt pump delivers up to 20 GPM (76 LPM) at 60 Hz. UL listed pump/motor. GPI M-3120-B100-ML 133200-05 115-Volt AC Heavy Duty Fuel Transfer Pump for B100 fuel with manual leaded nozzle. Delivers up to 20 GPM (76 LPM). 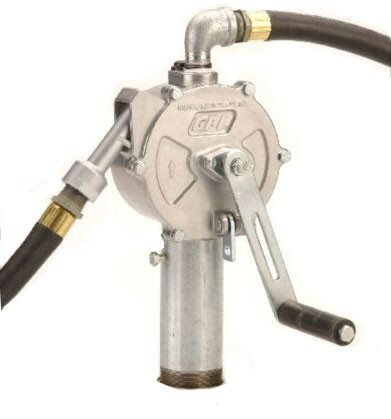 GPI M-3120-ML 133200-1 115 Volt AC Heavy Duty Vane Fuel Transfer Pump with manual leaded nozzle delivers up to 20 GPM (76 LPM). GPI M-3130-AL 133220-2 115 or 230, Dual Voltage AC Heavy Duty Vane Fuel Transfer Pump with automatic leaded nozzle delivers up to 30 GPM (113 LPM). An excellent choice for heavy equipment applications where high flow rate and high performance are needed. 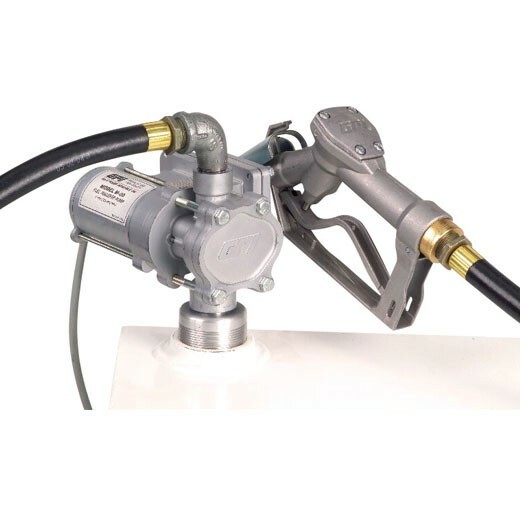 GPI M-3130-ML 133220-1 115 or 230, Dual Voltage AC Heavy Duty Vane Fuel Transfer Pump with manual leaded nozzle delivers up to 30 GPM (113.55 LPM). An excellent choice for heavy equipment applications where high flow rate and high performance are needed. GPI 110504-1 Overhaul Kit is the repair kit for GPI transfer pump model M-150, M-180, M-240 and M-1100 Series. GPI 114505-2 Overhaul Kit is the repair kit for GPI transfer pump model HP-100 Series. GPI 133501-1 1.25" Vane Kit is the repair kit for GPI transfer pump model M-3120, M-3025 and M-3425 Series. GPI 133503-1 Shaft Seal Kit is the repair kit for GPI transfer pump model M-3120, M-3130, M-3025 and M-3425 Series. GPI 13353302 Vacuum Breaker Kit is the repair kit for GPI transfer pump model M-3120 Series. GPI 13353303 Vacuum Breaker Kit is the repair kit for GPI transfer pump model M-3130 Series. 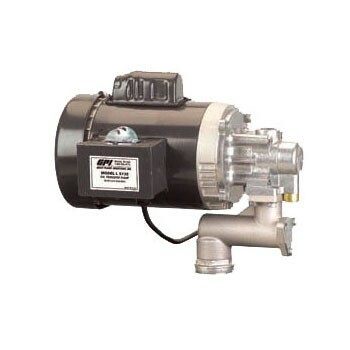 GPI M-150S-B100-AU 12-Volt DC Aluminum Gear Bio-Diesel Transfer Pump with Automatic Unleaded Nozzle. 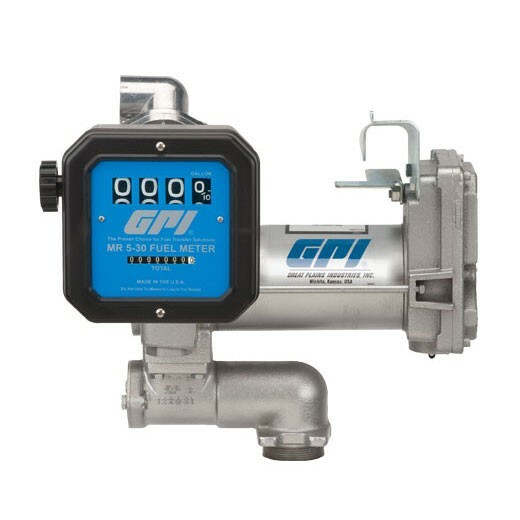 This GPI pump delivers up to 15 GPM (57 LPM). UL listed & CSA Certified motor. 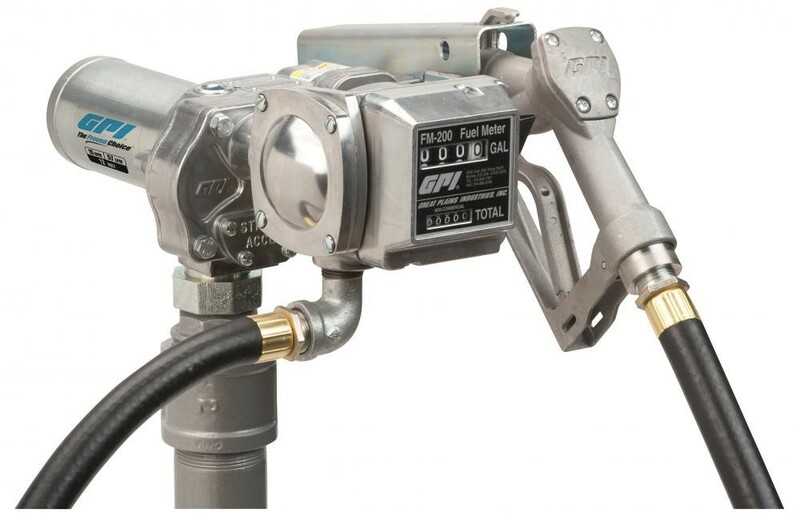 GPI MR 5-30 115/230-Volt Remote Dispenser Unit is designed, tested, and approved for use with gasoline, ethanol (E10 maximum), diesel and kerosene. Delivers from 5 to 30 GPM (19 to 114 LPM). 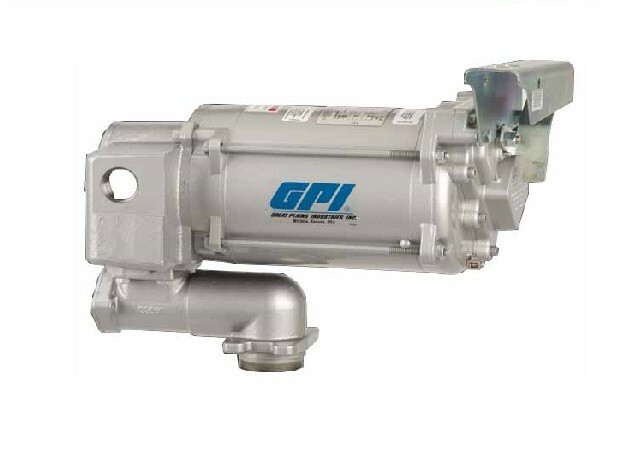 GPI M-150S-AU / FM-200-L6N is a 12-Volt DC Aluminum Gear Transfer Pump with Automatic Unleaded Nozzle and FM-200 Mechanical Fuel Meter (Liter). Calibrated in liters with 3/4 in. NPT outlet. Delivers up to 15 GPM (57 LPM). GPI 110244-02 is an adjustable suction pipe used for PRO20-012PO pump. 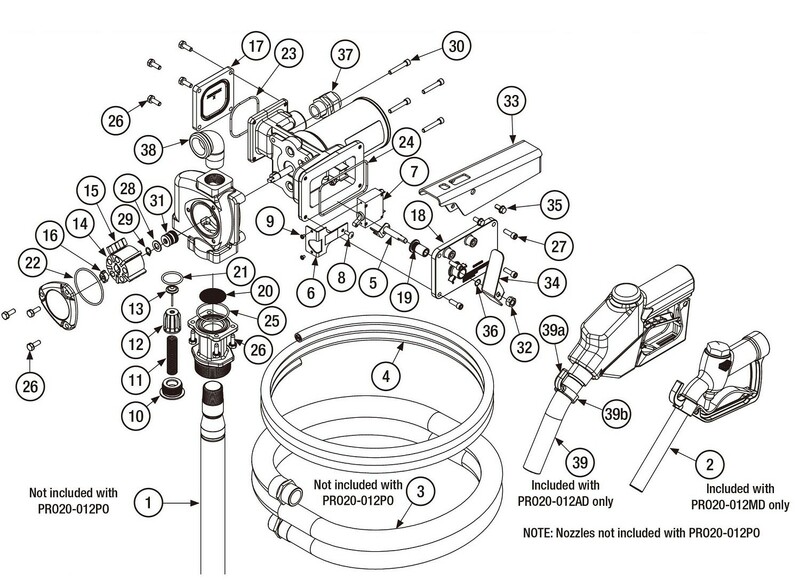 Item# 1 marked in illustrated parts drawing. 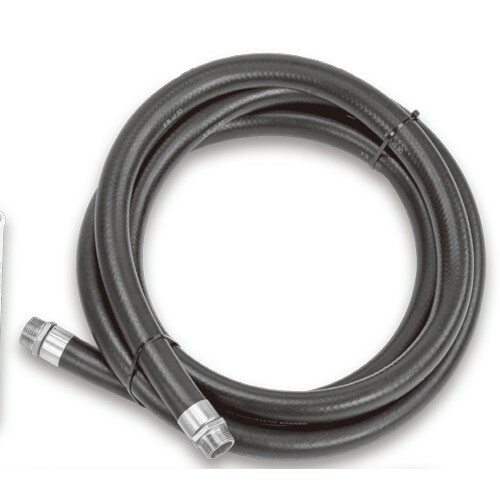 GPI 110188-02 is a 1" NPT x 18' Fuel Hose used with fuel transfer pump. Item# 3 marked in illustrated parts drawing. GPI 501010-01 is a 12GA, 18' Power Cord used with fuel transfer pump. Item# 4 marked in illustrated parts drawing. 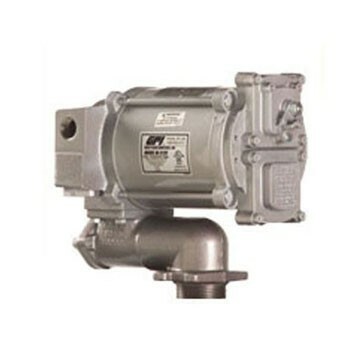 GPI 133086-501 is a Switch Actuator Assembly used with fuel transfer pump. Item# 5 marked in illustrated parts drawing. 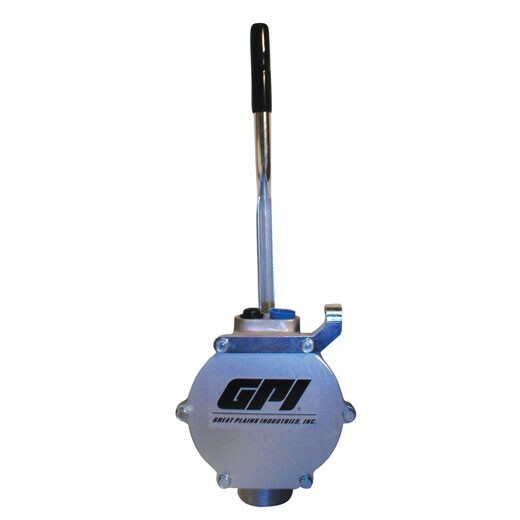 GPI 144125-01 is a Bracket Switch used with fuel transfer pump. Item# 6 marked in illustrated parts drawing. GPI 902006-555 is aCircuit Breaker Switch for 12 VDC fuel transfer pump. Item# 7 marked in illustrated parts drawing. GPI 904002-25 Truss Head Screw is used for fuel transfer pump, #10-32 x 1/2”. Item# 8 marked in illustrated parts drawing. GPI 904005-56 Stainless Steel Screw Pan Head is used for fuel transfer pump, #6-32 x 3/16”. Item# 9 marked in illustrated parts drawing. GPI 144102-01 Bypass Valve Cap is used for fuel transfer pump. Item# 10 marked in illustrated parts drawing. GPI 144104-01 Bypass Valve Poppet is used for fuel transfer pump. Item# 12 marked in illustrated parts drawing. GPI 144105-01 Bypass Valve Orifice Seal is used for fuel transfer pump. Item# 13 marked in illustrated parts drawing. 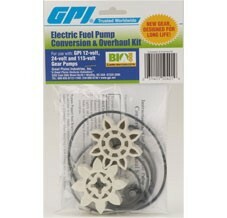 GPI 144100-01 5-Vane Kit is used for fuel transfer pump. Item# 14 marked in illustrated parts drawing. GPI 144111-01 1.50" Carbon Sliding Vane is used for fuel transfer pump. Item# 15 marked in illustrated parts drawing. GPI 144112-01 Drive Key is used for fuel transfer pump. Item# 16 marked in illustrated parts drawing. GPI 144124-01 Terminal Box Cover is used for fuel transfer pump. Item# 17 marked in illustrated parts drawing. GPI 144126-01 Switch Box Cover is used for fuel transfer pump. Item# 18 marked in illustrated parts drawing. GPI 144140-01 Inlet Screen is used for fuel transfer pump. Item# 20 marked in illustrated parts drawing. GPI 144127-01 Switch Bushing is used for fuel transfer pump. Item# 19 marked in illustrated parts drawing. GPI 901004-10 2.425 ID X .103 NBR O-Ring -143 is used for fuel transfer pump. Item# 22 marked in illustrated parts drawing. GPI 901004-12 2.737 ID X .103 NBR O-Ring -148 is used for fuel transfer pump. Item# 22 marked in illustrated parts drawing. GPI 901004-13 4.237 ID X .103 NBR O-Ring -156 is used for fuel transfer pump. Item# 24 marked in illustrated parts drawing. GPI 901004-26 1.925 ID X .103 NBR O-Ring -135 is used for fuel transfer pump. Item# 25 marked in illustrated parts drawing. GPI 904007-15 1/4”-20 x 3/16” Hex Socket Head Cap Screw is used for fuel transfer pump. Item# 27 marked in illustrated parts drawing. GPI 904008-53 0.750 x .063 Aluminum Washer is used for fuel transfer pump. Item# 28 marked in illustrated parts drawing. GPI 904008-54 10mm Retaining Ring is used for fuel transfer pump. Item# 29 marked in illustrated parts drawing. GPI 904008-57 1/4-20 X 1/2" HSHC Screw is used for fuel transfer pump. Item# 30 marked in illustrated parts drawing. GPI 501500-04 10mm NBR Shaft Seal is used for fuel transfer pump. Item# 31 marked in illustrated parts drawing. GPI 144129-01 Switch Lever is used for fuel transfer pump. Item# 32 marked in illustrated parts drawing. GPI 144132-01 Closed Nozzle Cover is used for fuel transfer pump. Item# 33 marked in illustrated parts drawing. GPI 904006-62 Center Type Hex Lock Nut is used for fuel transfer pump. Item# 34 marked in illustrated parts drawing. GPI 904008-52 Wave Overlap Spring is used for fuel transfer pump. Item# 36 marked in illustrated parts drawing. GPI 902005-91 Relief Strain is used for fuel transfer pump. Item# 37 marked in illustrated parts drawing. GPI 501500-03 Vane Kit includes includes 7 Vanes #14, Drive Key #16, Carbon Sliding Vane #15 & O-Ring #22 used on fuel transfer pump. GPI 904004-43 1" NPT Street Elbow is used for fuel transfer pump. Item# 38 marked in illustrated parts drawing. 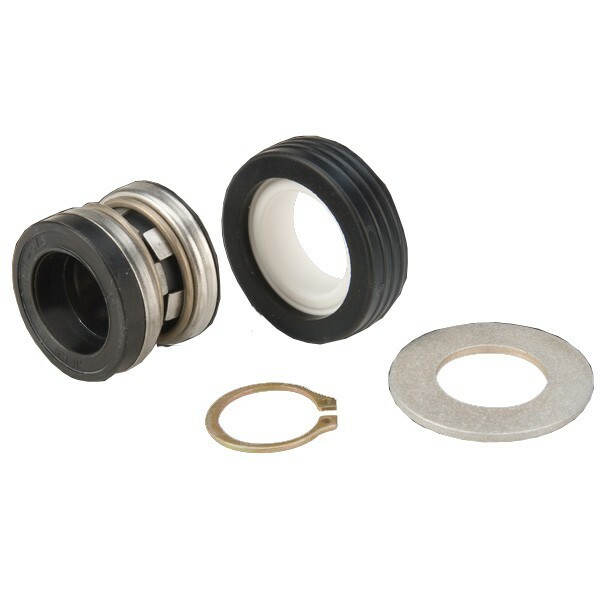 GPI 501500-04B Shaft Seal Kit is used for fuel transfer pump. Includes Retaining Ring #29, Shaft Seal #31, Spacer Washer #28. GPI 133076-501 Conduit Box Cover is used for fuel transfer pump. Item# 2 marked in illustrated parts drawing. GPI 133078-1 Switch Mounting Bracket is used for fuel transfer pump. Item# 4 marked in illustrated parts drawing. GPI 133081-1 Switch Lever is used for fuel transfer pump. Item# 10 marked in illustrated parts drawing. GPI 904006-38 3/8”-16 x 1” Hex Head Screw is used for fuel transfer pump. Item# 12 marked in illustrated parts drawing. GPI 901003-15 R/C NBR 3.359 ID X .139 O-Ring - 237 is used on fuel transfer pumps. Item# 14 marked in illustrated parts drawing. GPI 133020-1 Carbon Vane is used on fuel transfer pumps. Item# 17 marked in illustrated parts drawing. GPI 904006-33 1/16” Diameter Carbon Steel Retaining Ring is used on fuel transfer pumps. Item# 17 marked in illustrated parts drawing. GPI 133026-1 Slinger Washer is used on fuel transfer pumps. 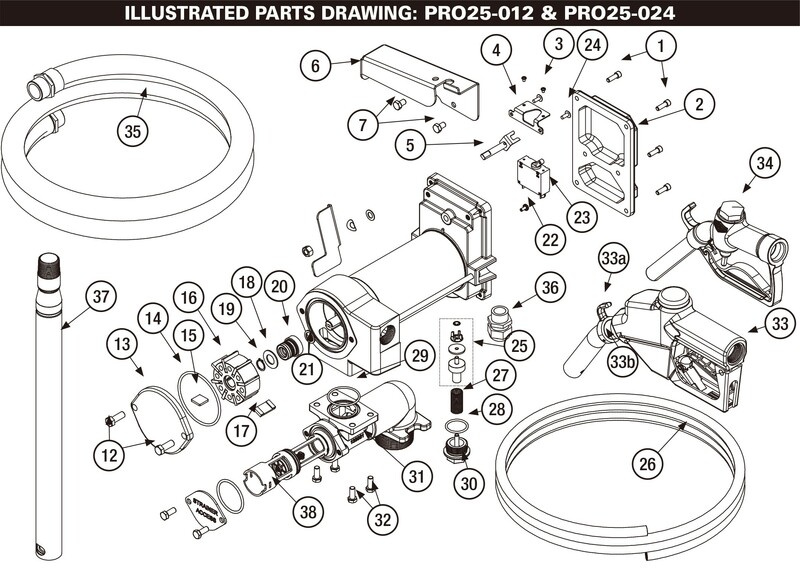 Item# 21 marked in illustrated parts drawing. GPI 904006-70 10-32 x 3/8” Binding Head Ground Screw is used on fuel transfer pumps. Item# 22 marked in illustrated parts drawing. GPI 501009-01 18ft 500W 10/2 Cord is used with fuel transfer pump. Item# 26 marked in illustrated parts drawing. GPI 133059-05 By-pass Plug is used with fuel transfer pump. Item# 30 marked in illustrated parts drawing. GPI 133052-501 Base Assembly is used with fuel transfer pump. Item# 30 marked in illustrated parts drawing. GPI 904004-37 5/16-18 x 1" Hex Head Screw is used on fuel transfer pumps. Item# 22 marked in illustrated parts drawing. GPI 904011-88 Set Screw Only is used on fuel transfer pumps. Item# 33b marked in illustrated parts drawing. GPI 110243-01 Steel Suction Pipe is used on fuel transfer pumps. Item# 37 marked in illustrated parts drawing. GPI 121013-503 Check Valve Assembly Kit is used on fuel transfer pumps. Item# 38 marked in illustrated parts drawing. GPI 133027-1 Spacer Washer is used on fuel transfer pumps. Item# 8 marked in illustrated parts drawing. GPI 133032-501 Coverplate is used on fuel transfer pumps. Item# 10 marked in illustrated parts drawing. GPI 13312401 Nozzle Cover is used on fuel transfer pumps. Item# 9 marked in illustrated parts drawing. GPI 1133033-502 Base End Plate is used on fuel transfer pumps. Item# 11 marked in illustrated parts drawing. 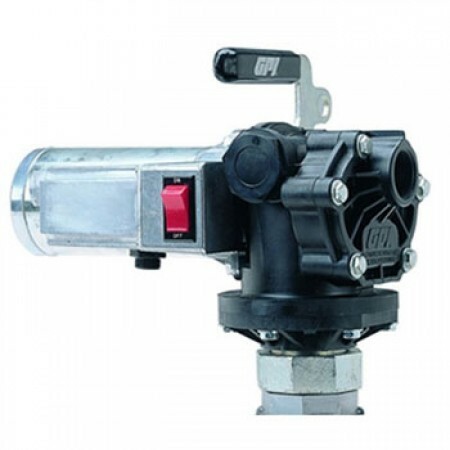 GPI 13312201 Switch Lever is used on fuel transfer pumps. Item# 12 marked in illustrated parts drawing. GPI 904001-37 5/16”-18 x 3/4" Hex Head Screw is used on fuel transfer pumps. Item# 17 marked in illustrated parts drawing. GPI 503500-02 Switch Kit is used on fuel transfer pumps. Item# 19 marked in illustrated parts drawing. Includes Instructions. GPI 133848-01 Switch Bracket is used on fuel transfer pumps. Item# 20 marked in illustrated parts drawing. GPI 904004-97 Retaining Spring is used for fuel transfer pump. Item# 23 marked in illustrated parts drawing. 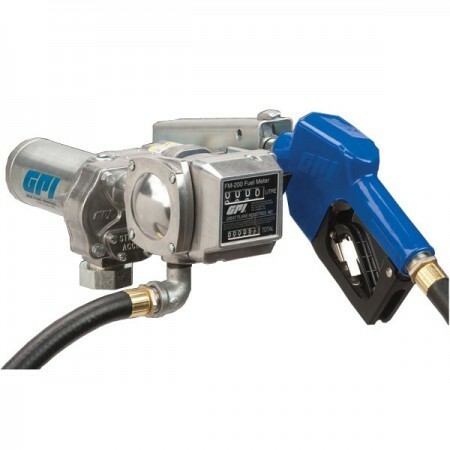 GPI M-150S-E-PO-BYO 110240-02 12 Volt Fuel Transfer Pump delivers up to 15 GPM (57 LPM). Comes with nozzle cover and is ideal for applications where accessories are already available. 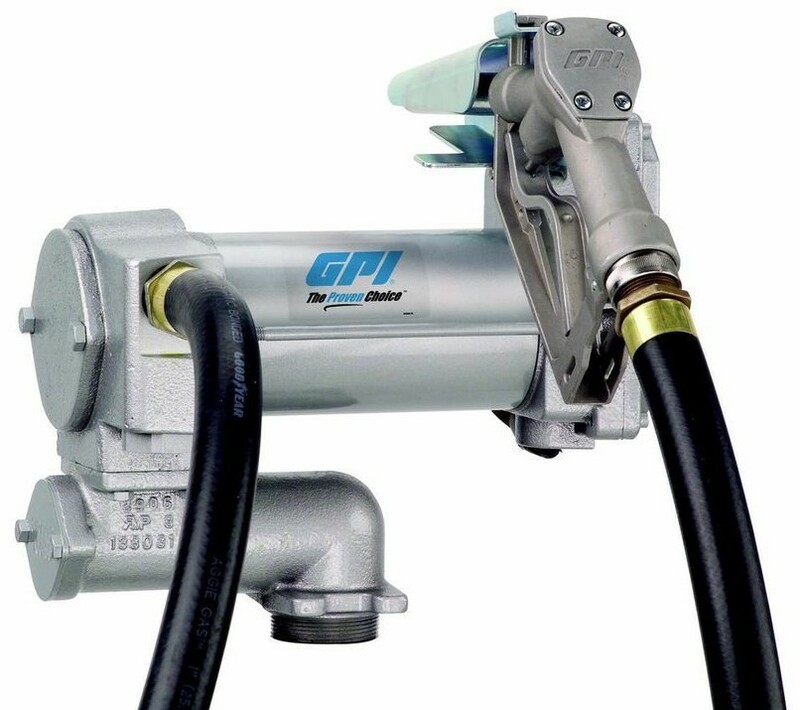 GPI M-180-PO 110300-7 12-Volt Fuel Transfer Pump with Automatic Nozzle delivers up to 18 GPM (68 LPM). This GPI 12 volt diesel pump is a quick and ideal way to deliver gasoline, diesel and kerosene to farm and construction vehicles and equipment. 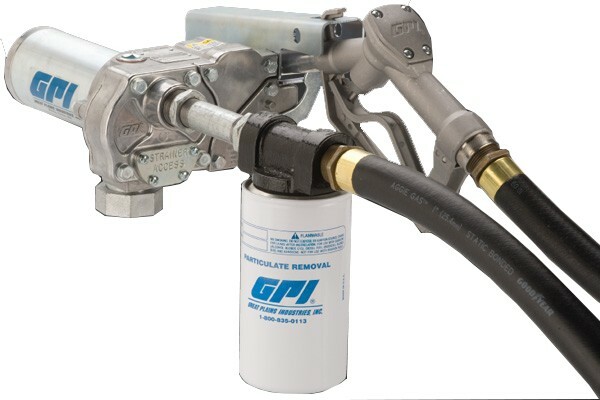 GPI 110612-01 M-180S-ML W/Filter 12-Volt Fuel Transfer Pump with Manual Nozzle delivers up to 18 GPM (68 LPM). This Fuel Transfer Pump comes with a manual nozzle & filter and is a cost effective way to transfer fuel quickly and easily. 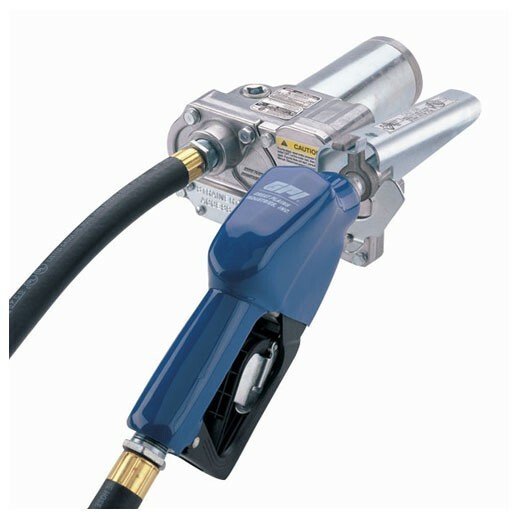 GPI 110612-02 M-180S-AU W/Filter 12-Volt Fuel Transfer Pump with Auto Nozzle delivers up to 18 GPM (68 LPM). This Fuel Transfer Pump comes with a manual nozzle & filter and is a cost effective way to transfer fuel quickly and easily. 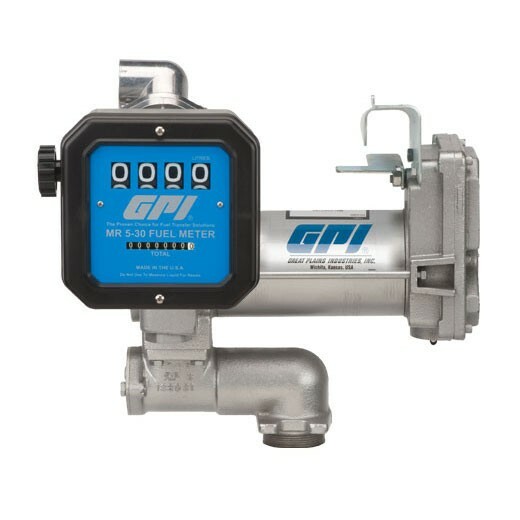 GPI M-150S-MU / FM-200-G6N 110610-11 12V Fuel Transfer Pump / Meter Combo is a complete refueling system that delivers long run times and exceptional performance. 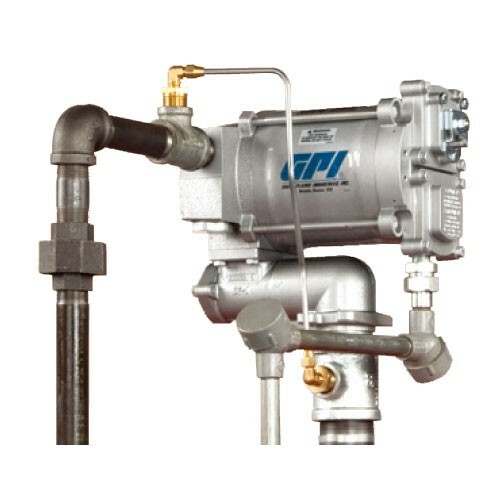 This GPI 12 volt pump delivers up to 15 GPM (57 LPM). GPI M-150S-MU / FM-200-L6N 110610-12 12V Fuel Transfer Pump / Meter Combo is a complete refueling system that delivers long run times and exceptional performance. This GPI 12 volt pump delivers up to 15 57LPM (15 GPM). GPI M-150S-AU / FM-200-G6N 110610-13 12V Fuel Transfer Pump / Meter Combo is a complete refueling system that delivers long run times and exceptional performance. 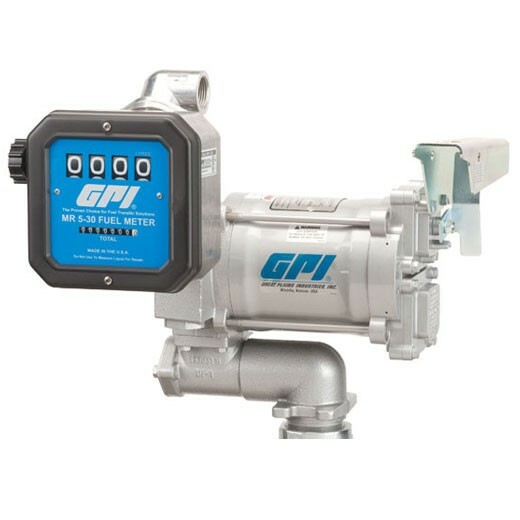 This GPI 12 volt pump delivers up to 15 GPM (57 LPM). 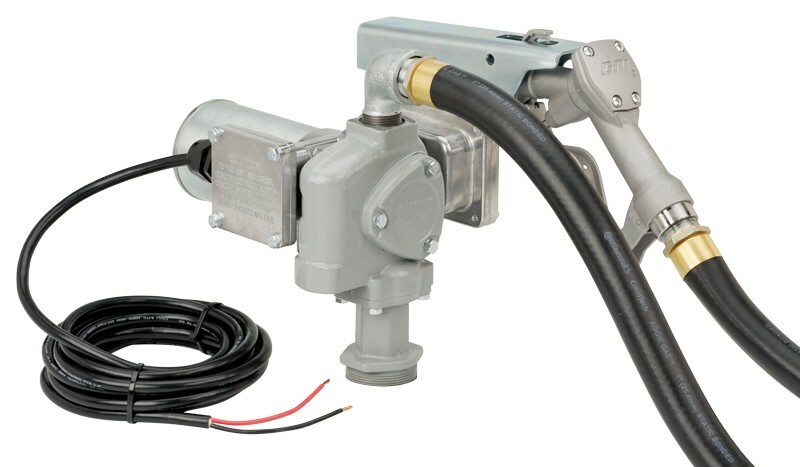 GPI M-3020-AD 144000-01 12V Fuel Transfer Pump uses a rotary vane design and is made from durable cast iron. The 12 V(dc) motor delivers flow rates up to 20 GPM (76 L/min). U.L. listed motor to U.S. and Canadian standards. 2-year warranty. 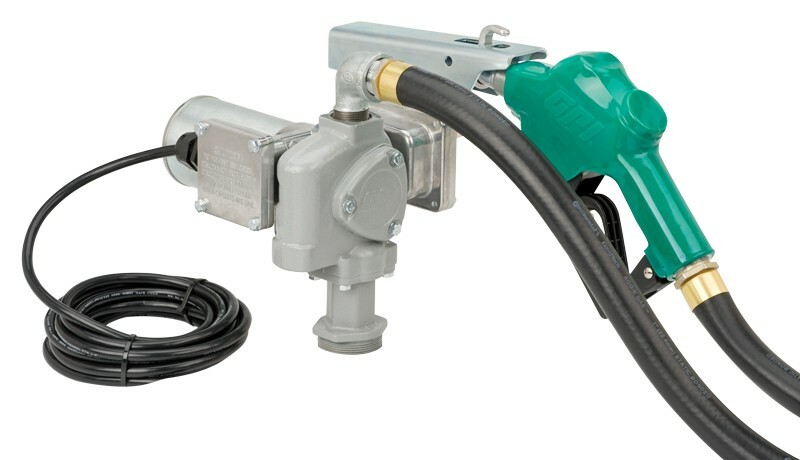 GPI M-3020-ML 144000-02 12V Fuel Transfer Pump uses a rotary vane design and is made from durable cast iron. 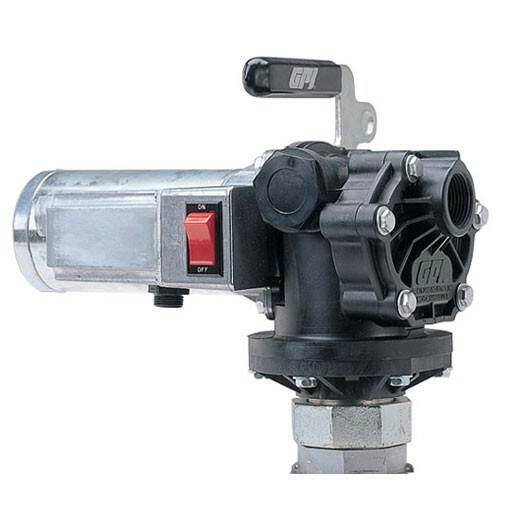 The 12 V(dc) motor delivers flow rates up to 20 GPM (76 L/min) with a manual nozzle. U.L. listed motor to U.S. and Canadian standards. 2-year warranty. GPI M-3020-PO 144000-03 12V Fuel Transfer Pump uses a rotary vane design and is made from durable cast iron. The 12 V(dc) motor delivers flow rates up to 20 GPM (76 L/min). U.L. listed motor to U.S. and Canadian standards. 2-year warranty. GPI 133262-93 M-3025CS-PO XTS 12-Volt DC Electric Vane Contractor Special Pump only. Delivers up to 25 GPM (95 LPM). This 12V Extreme Temperature Series (XTS) model is used for -40° F Cold weather. GPI 133260-03 M-3425-PO 24-Volt DC Electric Vane Pump only. 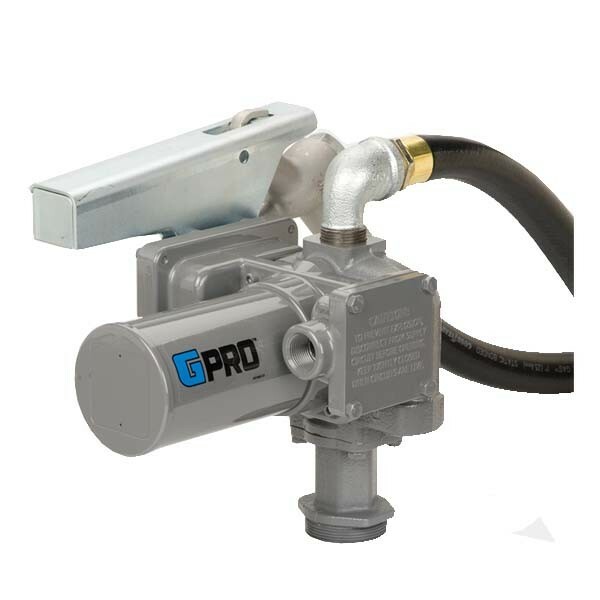 This GPI pump delivers leaded fuel up to 25 GPM (95 LPM). 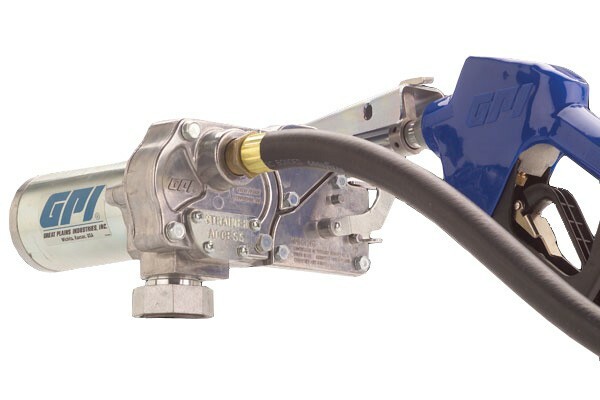 Use this high performance Fuel Transfer Pump on vehicle mounted tanks or vented storage tanks or when reduced fueling time is critical. GPI M-3120-RDP 133200-10 is a 115 Volt AC Remote Heavy Duty Vane Fuel Transfer Pump for applications where a cabinet model is not required. Includes dedicated pump only for remote dispensing systems. Dispenses fuels up to 20 Gallons Per Minute. GPI M-3130-PO 133220-03 115 or 230, Dual Voltage AC Heavy Duty Vane Fuel Transfer Pump only delivers up to 30 GPM (113 LPM). An excellent choice for heavy equipment applications where high flow rate and high performance are needed. GPI M-3130-PO 133220-93 115 or 230, Dual Voltage AC Heavy Duty Vane Fuel Transfer Pump only delivers up to 30 GPM (113 LPM). This Extreme Temperature Series (XTS) model is used for Cold weather. GPI M-3130-RDP 133220-05 is a Remote Dispenser Fuel Transfer Pump for applications where a cabinet model is not required. Delivers up to 30 GPM (113 LPM). Includes dedicated pump only for remote dispensing systems.